Golden Gate Park, SF. – August 28, 2013 – What could make a weekend of Paul McCartney, Red Hot Chili Peppers, and Vampire Weekend better? How ’bout visiting the Speck crew to get your hands on a brand new SmartFlex Card case? 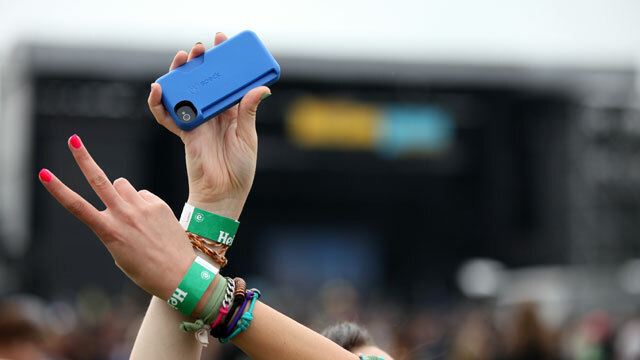 Carry less with Speck’s convenient protection + wallet case, the ideal concert going case leaving your hands and arms free to dance all festival long. Speck took on San Francisco’s favorite music festival, Outside Lands, with colorful candy and protective case pairings, plus a recycling program to reach the eco friendly festival goers. Fans stopped by our booth and recycled their old, beat up phone case(s) and in return protected their phone with a colorful new SmartFlex Card. Of course, we had to capture their shiny, happy faces with their new colorful Speck cases on Facebook. If they tag their pictures on Facebook.com/Speck, they entered a contest to win tickets to next year’s Outside Lands. By the end of the three days, we collected over 500 of your old cases (including Otterbox, Incipio, Incase and Case-mate). Many of our fans already had Speck cases and stopped by just to show us. We gave them a little #respecked and a new Speck case if they tweeted at us, just to say thanks for being a Speck fan. Here’s a quick gallery of our new friends from Outside Lands. Check out some of our favorite shots below!